Let’s face it. Writing a book is pretty tough work. And, for many authors, the idea that “the book” is just the beginning of everything you have to master, can be a real head-spin. After all, you’re not only expected to be able to put together an amazing book, now you need to be a marketing master, social media guru, expert sales-person, and technology savant? Not exactly a reasonable expectation. Especially when all you really want to do is focus on writing and building your exposure. One of the major sticking points for authors I’ve spoken to is technology. That is, the tech you’re somehow “expected” to know how to use in order to get your books and your brand out there. And 90% of that technology is your website. It gets confusing, fast. And with so many moving parts, it’s easy to end up with something that (a) doesn’t work at all, or (b) works, but looks and feels terrible. A Free Website – something like a WordPress.com blog or similar. Upside – well, it’s free. Downside… well, it doesn’t do anything much beyond displaying words and pictures. Oh, and your host will probably slap ads all over it unless you pay them. Cheap Themes – if you’re going to pay someone not to show ads on your site, you might as well pay someone different to get your own site. Upside – this will often only cost around $100 – $200 a year. Downside – you pretty much get a blank theme and have to build out all the functionality yourself (like landing pages, book pages, ebook delivery, etc). Meaning often months of “duct taping” together different plugins – or expensive third-party software – which usually ends in an incoherent mess (that breaks. A lot). Oh, and you probably won’t get any support from the theme developer, either. Website Builder Software – an excellent idea for businesses in general, your “drag and drop” website builders can often look great. However, they usually don’t come with features and functions needed for authors – so you’ll need to add on more third-party “page builders” or other services to use on top of those. Depending on the options you choose, you could easily end up spending $100+ a month (plus tax in some cases) and you’ll still need to design it all yourself and hope all the different moving pieces work together and look coherent (PS – I used this option for years, and the results were okay, but expensive, and I know all the fun downsides like integrations not working, fonts looking different, pages not updating, and all that lovely stuff where all your different pieces of software have different “bugs” and don’t play nice together). Website Designer – hiring someone to do all the work for you sounds good, but bear in mind how much you want to spend. Example – you could spend a few hundred dollars for someone to install a standard theme for you. In which case, you still need to build it out properly yourself (see above). Or, you can pay $1,500 or more to get a custom theme put together, which will have some functions. Or, you can go the whole hog and get a fully customised author website designed from scratch – in which case, the only limit is your budget (but think $5,000+ as a starting point). But also bear in mind those costs are just for the design… if you want ongoing support and updates you’ll be paying extra. (PS – I’ve also used designers. They’re worth their weight in gold, but they also charge accordingly). So, the upshot is – if you’re an author, it’s tricky to get a site that (a) looks great, and (b) does all the “stuff” you need it to do, without spending huge amounts of cash or driving yourself up the wall. Now, if you’re an expert designer and know how to integrate a bunch of different pieces of software (and maybe even enjoy it) then all is good. But if not, the options can be a little daunting. All this frustration is why I spent 2+ years working side-by-side with a world-class website developer to design something just for authors. Something that gives you everything you need for your author website in one tidy package (meaning no more “duct taping” together endless plugins or other services). Our all-in-one website theme for authors – Author Cats – is your “website in a box”. And you can test-drive it for free with our 14 day free trial. More important for me – I want to make sure you have the principles and tools you need to create an amazing author website that’s going to grow your audience, book sales, and your business. So, whether you choose to use Author Cats or not, this article will give you a breakdown of the 7 key elements that will help you build an awesome author website. If your website can do all these things (and look good doing it) then you are good to go. And if you’d like to test-drive Author Cats for free, all the screenshots in this post are right out of websites that authors have created using our templates and theme – so you can get the same results without needing an engineering degree or a team or 1,000 nerds. So, first things first… So many authors get confused about the real purpose of their website. Common misconceptions about a website’s purpose include: “To look nice!”, or “To strengthen my brand.”, or “To give my readers my info about me.”, or even, “I’m not sure… but I know I’m supposed to have one!”. Sure, creating a cohesive user experience, solid branding, and information about you is all important – but it’s not the core purpose of your site. These are secondary goals that feed the core purpose of your site – to make you money, drive sales, and grow your business. These are meaningful, measurable goals that can be tracked and improved – and it’s essential you get this straight before doing anything else. For many authors, the homepage of their site is going to be the #1 most visited page. Makes sense, right? Readers are searching for you, so your website’s main page is going to crop up on search engines first. Chances are, your homepage is going to be the best chance to make a good first impression. And remember your site’s core purpose? Yup – focus on driving actions from your visitors that are going to grow your business. Namely, getting the sale or getting visitors to sign up for your email list (we call this a “visitor conversion”). I prefer the latter – if someone joins my email list, that gives me the opportunity to sell multiple books to them over time. A sale is great, but when you’re sending your website traffic off to Amazon or another book store, you lose that person and can’t follow up with them. Get them on your email list, and you have the chance to build a real relationship with them, increase loyalty, and make multiple future sales (as well as getting more reviews and other lovely stuff). Notice how Libby has put visitor conversions front and centre? There’s an opt-in bar at the top of the page (in red) and a matching opt-in button underneath a compelling headline – coupled with a great image of her free book. Now, Libby has an excited reader signed up to her email list – one that is likely to buy from her again and again in the future. All the other juicy goodies (like info about her books, her bio, contact pages, blog, etc) come further down the page. The main focus is converting visitors into subscribers and paying readers – and with a design like this, Libby can be sure her site is optimised just for that. Your “Books” page is likely to be the second-most visited page on your site (most people will enter your site via the homepage or a Landing Page, which we’ll cover later) and is where you’re going to make the bulk of your sales via your site. So, we’d better get it right! Imagine this… you’ve spent months – or even years – putting a book together. You’ve invested in quality cover design, editing, proof reading, and formatting. But your website looks clunky and amateurish. Not matter how polished your book is, a poor site design is going to damage your sales and ruin all that good work. John’s books are stylishly presented, with a cover design appropriate to the genre, easy to read copy on the page, and a clear call to action (“Get my book for only $2.99 at the following retailers) with some compelling review snippets. There’s room underneath for a longer description, but the key copy elements are included in the grey section above the fold – so readers don’t have to scroll down to read it. Don’t info-dump or fall victim to the dreaded “wall of text”. Meaning, make sure your sales copy is short and to the point. If you have long copy, break it up on the page so readers don’t go blurry-eyed and run for the hills. Clear call to action. Don’t be wishy washy. Ask for the sale. Put buy buttons (or free download buttons) somewhere obvious and above the fold, so people don’t have to scroll down to see them. Reviews. Nothing helps sales like social proof. Include reviews or review excerpts wherever you can. Images. Forget the old saying, readers do judge your book by its cover. So put your book cover front and centre and make it sing. Simple, clean, easy-to-navigate design helps readers find what they’re looking for. From a design perspective, that’s going to be the key to getting your books noticed and driving readers to take action. Right… so we’ve got the Home Page and Books Pages all sorted. What’s next? Your Home Page is the “front page” of your site, and where the majority of organic traffic is going to arrive at your site (organic = people searching for you). Readers searching for you will expect to be able to find out more about you – which is why your Home Page includes links to your books, your bio, and other juicy details. That’s the whole page. There’s nothing else. No links to your bio, or Twitter page, or anything else to distract from this page’s core purpose. Your Landing Page is a super-optimised page designed to get readers to sign up for your email list. End of story. Because of this, many Landing Pages can convert up to 80% of visitors into email subscribers – meaning your audience and email list will grow faster (more future sales for you). Your Landing Page is the link you’ll give readers in the front and back of all your books, at live events, in your advertising, and everywhere else you can. So it’s important you get it right. After a reader joins your email list (from either your Landing Page or somewhere else on your site) you need to give them a confirmation page, or “Thank You” page. And this is a kind of Landing Page – except it’s a page readers are automatically directed to after signing up that confirms their subscription and it gives them instructions on what to do next. The truth is, if you do nothing, a large proportion of your new subscribers won’t open your first email (the one that delivers your free gift and introduces them to you). Your job is to maximise the number of readers who open this email, download their free book, and get excited about future emails from you. And your Thank You page is a key part of doing that. Headline: Thank You! You’re all signed up. Copy: Please go and check your email – I’ve sent you an important message with instructions on how to get your free book. Don’t forget to check your junk mail if you can’t find it. Nothing too crazy, right? But so many authors forget to include simple instructions like this, and it does make a difference (we tested hundreds of thousands of website hits and found roughly a 30% improvement). Did you know McDonalds makes zero profit from sales of burgers? All the money is in the “other stuff” you buy – like fries, drinks, sides, etc. That’s why all the servers ask “Would you like fries with that?” when you order. And you know what? It works! In industry-speak this is known as an upsell or cross-sell, and the reason it’s so successful is that customers have already interacted with you positively in the seconds before… meaning they’re highly likely to take you up on your offer. The same is true with giving away a free gift. When someone signs up for your email list (usually in return for a free book or other gift) they are super receptive to other offers you make at the same time. And because you’re asking for the sale at the same time as giving away a gift, you’re not interrupting them (imaging a McDonald’s employee calling you up at home the next day and asking “Would you like fries with that?”. Not as effective, right? In fact, it would be downright weird). So, in short, when you put an offer on your Thank You page – especially a “special deal” like a price discount – you’ll find many readers will take you up on it. And, to make it even better, it doesn’t even feel like you’re “selling”. Win win! In fact, after analysing thousands of dollars’ worth of ad spend, we found that including a sale offer on a Thank You page can convert at up to 15% – meaning 15 out of every 100 visitors take you up on it – and in many cases actually paid for the ads in full, without taking into account future sales. Not bad! It’s a very similar design to a regular landing page – but instead of asking for a sign-up, it’s offering people 25% off when they order the next 2 books in the series together as a bundle. Much of your email list building efforts are going to come from offering a free gift (usually a book) to readers when they sign up to your email list. We call this process Reader Magnets. We’ve covered how to get readers onto your email list, but how do you deliver the book to them? It’s simple enough to configure your email software (eg: Mailchimp, Aweber, Mailerlite, etc) to send an automated email to readers when they sign up – so all you need to do is link to an ebook file, right? The problem is, with most readers opting to read books via a reading app or dedicated e-reader (like Kindle), you can’t just send people a link to a PDF. Sure, that *can* work, but the user experience is terrible. Ideally, you need to send people a fully formatted ebook file (either a .mobi file for Amazon Kindle or .epub file for everyone else). And that means readers are going to struggle loading up their new ebook properly – as the methods used to get an ebook file onto the right device vary hugely depending on what device or app the reader prefers. Meaning – if one reader is using a Kindle e-reader, one reader is using an iPhone, and one reader is using a different type of reader like a Nook or even a tablet, then the instructions they need to follow are completely different. So, when you deliver your free gift you need to make it super easy for readers to (a) collect their ebook file, and (b) actually get it on to their device and start reading. Adding this functionality will increase the number of readers who follow through and actually read your book – meaning more happy readers and more potential future customers. After your homepage and landing pages, your About Page is likely the next most-visited page on your site. Readers want to know more about you, right? The problem is… well, they only really want to know information that’s going to benefit them in some way. So, a long bio is all well and good, but your readers still want to know why they should be interested. In other words… make your About Page about your readers as well as about you! Tell your story, for sure, but make sure you link back to what’s in it for your fans. Here, we’ve got all the usual elements (background, bio, etc) but also a focus on the core purpose of the site – namely, having an opt-in button smack-dab in the middle so readers can’t miss it. Your About Page is a high-traffic page, remember – so make it more about what your readers can get from you… and make it easy for them. So, that’s the 7 key elements covered – but there are some other considerations… Let’s take a look at some Honourable Mentions. Blogs can be an amazing resource for some businesses. But if you’re a fiction author, it’s a little more tricky to figure out a topic to write about that your readers will find interesting (that’s why we didn’t include it in our main section above, as it depends what you write about). If you write non-fiction in a very specific niche, then that’s a different kettle of fish. In which case, your blog can easily be a very powerful tool to get you noticed on search engines – and provide you with compelling assets you can use over and over again to drive traffic, signups and sales. Libby’s blog (above) is simple, clean, and effective. And it’s easy for her to add in opt-in buttons inside her articles, and include other Call to Action features in her blog’s footer area. So, if you’re a blogger – don’t forget those core principles… Make sure your whole website is optimised for driving sales and sign-ups. I’ll make no secret about it… but I LOVE joint promotions for authors. But it’s an optional bonus to have these, which is why we left them out of our main list (but we still highly recommend doing them). The concept is simple… team up with just two or three other authors with a similar reach and audience to you, and you’ve just quadrupled your potential sales. Each cover image links to the authors download or sales page, and you can easily swap out the images and links to use in future promos with different authors. Then, just give the link to this page to your partners, and you’re good to go! Doing a book signing? Going to a conference? Doing a tour? You can use a dedicated events page (like above) and you can even list your appearances out on your homepage. It’s up to you! Of course, not everyone does live events… so we left this out of our main list, but definitely worth an honourable mention. All the websites you’ve seen in this Cheat Sheet were made using our designed-for-authors website and marketing platform – Author Cats – which has been under development for 2+ years and contains everything authors need to grow their audience, sales, and careers – all in one tidy package for WordPress. Integration – hook up Author Cats to your email marketing solution of choice. We support pretty much anything – no crazy API coding or techno-tomfoolery required. Easy to Install – simply upload our software package into a WordPress install on your own domain (or set up a new one) and you’ll be ready instantly. 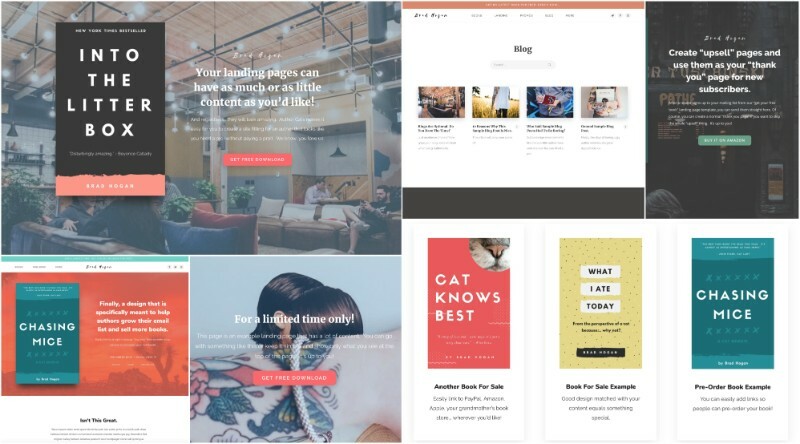 Author Cats installs straight into your WordPress self-hosted website and includes everything you need to create a beautiful, conversion-optimised author website that looks like it was designed by a six-figure designer (but without the price tag). We also include pre-made templates, hours of detailed video training, and full “walk-you-through-it” support, so if you need a helping hand (or want us to set up a staging site for you so you don’t experience any down time) that’s all included. Got any questions about Author Cats (or author websites in general)? Drop ’em in here! I bought your program and started out writing a non-fiction help book. Then I had a brain storm to turn it into a “course” and from the “course” write the book. I want to have the “course” available on my website with password protection. I’d then add my book and then a card pack similar to Tarot Cards (but they are not Tarot Cards!). Would your program accommodate this? If we got a “a membership site + course videos ” plug in, would it work with your program? Hi Jo! If you’re using self-hosted WordPress (you are paying for your own web hosting and domain), your blog site will be using a Theme. this is “what you see” when you load the webpage – the theme dictates how the site looks and how your content is displayed. Author Cats would replace your existing theme, but you’d keep all the content you’d written. You would be basically giving it a facelift plus adding all the extra functionality like landing pages, thank you pages, ebook delivery, promo pages, book display, etc, etc. Thanks for this Nick. I bought Authorcats when it was launched even though I wasn’t ready to do anything with it at the time. I’m moving ever closer to the point that I will be, and this article will be a huge help in getting it right. Looking forward to seeing the finished site! Thanks for the idea! In the meantime, if you don’t want the site to automatically choose the “other books” part, you can always turn it off and add your own selection in using the “long description” section in the “books” pages, when you set them up. Looks cool! However, one thing I’m unclear on is how the subscription works? If your solution is a WordPress plugin, does it disable itself if the subscription isn’t paid? What would happen to the site if a payment is missed due to the credit card expiring? Thanks in advance. Hi Matt! If a credit card has issues then we simply contact you to update your details. Eventually, you would get a “please activate your license” banner warning on your site but it doesn’t happen immediately. Hope that helps! My website is on squarespace. Will you have an option for non worpress sites? Not at the moment, Denise – unfortunately. We only have plans for a WordPress version right now. I love your news, Nick, I really do! Hey! I’m still working on my AuthorCats website, but one thing my readers ALWAYS ask about is buying signed paperbacks. Do you have a recommended plug-in to add that functionality to the site? I don’t want to have to move to squarespace!! Hi Nick. I’m sure you still have your own author website, but I can’t find it via Google. What’s the URL? you’ll sometimes need to put the word “author” in any search you do – it’s not always possible to get your exact name in .com (if you search my name, that site is the second result for me). Most people will go with “jameskingbooks.com” or “jameskingwrites.com” or go with a different suffix (“jamesking.net”). Most of your traffic will be coming from outside Google searches though (especially for fiction). I personally have 6 different websites (one under constructions) for different things. You can have one website for everything, or separate websites – up to you! Obviously, the latter option requires more upkeep. Do You Hate Complicated Tech? Author Cats has been really great. The demo sites were useful to use as a template. It took about a week to get set up. I contacted support to set up a staging site, which was fantastic. Otherwise the guide covered everything.